Super Hero Boy: One of the best forgotten shows from the 80s! One of the best forgotten shows from the 80s! I had almost forgotten about Shelly Duvall's Faerie Tale Theater. Though I honestly have no idea how I could forget, it was one of the most awesome TV series ever made in my opinion. I'm not sure how Shelley convinced these huge stars to come on and make Faerie Tale episodes in the first place but what happened in the 26 episode series is pure magic. If you've never seen Shelly Duvall's Faerie Tale Theater just try to imagine Robin Williams as the Frog in the Frog Prince (no not as the price... as the frog) or Carrie Fisher as Thumbalina. The entire series is filmed on these amazingly gorgeous old school theater sets something as you would imagine to see in a really great children's theater but on a much bigger beautiful scale. There are no CGI or the type of special affects you would expect to see these days so in a way the stories have a life all their own, not something you would see often these days as fantasy sets are soo expensive to create not to mention the amount of detail needed. The costumes used are no exception as well it reminds me a bit of the early Jim Henson work. I had almost forgotten about the series all together until I saw the release date set. Then it dawned on me, my very first love affair with Tim Burton started with Beetlejuice and Faerie Tale Theater. He directed one of the episodes, Aladdin, and let me just tell you up front its nothing at all like the Disney version. Actually as a kid it scared the crap out of me and mesmerized me all at once. I honestly cant even begin to believe I forgot about it if your a Burton fan its worth every penny to buy the set just for that episode. You can see so much of his later work in just that one piece. Its a great series if your just reliving it or if you have never seen it. I will note though some of the episodes may be a bit too much for young children. Though kids will love it it has a bit of adult humor in it here and there and some of the scenes in some of the darker fairy tales can get quite creepy. Shelly Duvall's Faerie Tale Theater is available right now on Amazon! 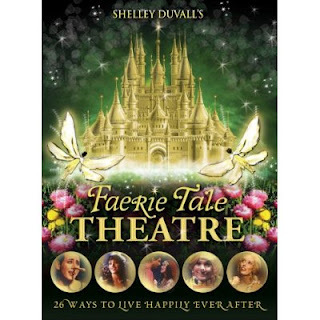 I have one copy of Shelly Duvall's Faerie Tale Theater to give away to one reader! Leave a comment on this post. Check out Shelly Duvall's Faerie Tale Theater and tell me which actor from the featured ones are you most excited about seeing in this series? I really like Robin Williams. I've enjoyed his acting for years. I seen a Shelly Duvall show years ago with neet actors in it. I really enjoyed watching it. I hope I win. Love the Directors too. Pretty cool to get such neet Directors. I am most excited about Mick Jagger! Thanks... I too remember these shows now that you mention them and I'd love a copy of the DVD for my family. Oh, my word! I can't pick just one! I love them all...this was such a remarkable series, and so short lived! I remember this! I love Susan Sarandon, James Earl Jones and Robin Williams. This is such a cool giveaway. I love Billy Crystal so I'd love to see him in this! How exciting! My husband is a few years older than I (hehehe) so he's be SUPER STOKED if I won this dvd. This sounds great! I'd say who I'm looking most forward to is Tim Burton (not an actor, I know). But I'm a HUGE Tim Burton fan! I'd love to see Billy Crystal in this. Billy Crystal and fairy tales just work together. Thanks for the chance. I remember this series well and it was superb. I am most excited to see Robin Williams, I love him! I think I remember seeing these when I was younger. I'm looking forward to Robin Williams. He is so funny and cool. I'm looking forward to seeing Shelley Duvall in this series. Oh, I'd love to win this series. I'd love to be entered. To answer your question, I'd go with Robin Williams. Here is my post about the contest. Robin Williams because he is funny as well as being a talented actor. My vote goes to Robin Williams! I used to watch this show a lot. Billy Crystal. I 'd love to win this for our family. It was such a great series. I'd love to win this! I think I'd be pretty excited to see Billy Crystal. Shelly Duvall has such a way to make odd faces and sounds. I am really looking forward to it all, but her the most. Robin Williams without a doubt! I'm excited about both Robin Williams (is there a better improv artist than him?) and Billy Crystal. Now that Billy Crystal has written books for his grandchildren, I'd really be interested in seeing what he might do next. Billy Crystal always does a good job! Thank you for having this. I am looking forward to Robin Williams. Looks fantastic! thank you! Who would I look forward to? All of them, Robin williams, Shelly Duvall,Susan. They lose their idendity and become characters. This is what makes me look forward to seeing them. hey.. i would love to be entered for this giveaway! hmm..about picking one author..that's a tough thing to do.. but i guess Robin Wiliam is my favorite among all others! Christopher Reeve would be choice. I am guessing my daughter would love to watch this too! I'm most looking forward to seeing Billy Crystal, but I would love to see all of these great actors in this series. Thanks so much for such a great opportunity! I would like to see any of them but Robin Williams is so special. My daughter loved this series. I'd love to see Elizabeth McGovern as Snow White. Oh! I love Robin Williams! I think Angelica Houston is a great character acter and would love to see her work in this project. I would enjoy seeing Robin williams and Billy Crystal. I LOVED these when I was a kid. I remember them on Showtime and my favorite was Rapunzel. I seem to recall her eating radishes every way. If that's it, the radishes were the most memorable star for me. Chocolate covered radishes, yum. As far as actors, Robin Williams sticks out in my mind, but I'm sure there are others I can't think of, but would love to see. Great prize!!! I heard Tim Burton has something to do with it, but i don't know if he's actually in the show (if he was i'd definitley pick him!)? If he's not then I'd choose robin Williams. He alway brings good humor to the shows he's in. I also loved these when I was a kid. Did you realize that Michael Richards (Kramer) is in two of the episodes? I sure didn't. I'd love to win. I've always loved Christopher Reeve! I love Bernadette Peters! My favorite episode is the Three Little Pigs. Fantastic series! I’m most excited about seeing Robin Williams as the Frog Prince. I was watching these on YouTube for awhile until that person’s account got suspended when this was released on DVD. We love Robin Williams and I know he would make a great prince.Thank you so much for the chance to win this! I am most excited about seeing Robin Williams,he is one of my favorite actors. I am also a huge Robin Williams fan and would love to see him in the Frog Prince. Thanks for the great giveaway! I'm most looking forward to seeing Howie Mandell, how funny. Robin Williams has to be great. I dont really remember this show, I think I was 4 when it came out. It is totally something me & my girls would love though! We adore Robin Williams and this would be fantastic! I love Shelly Duvall. I have her DVD "Bedtime Stories"
I loved the Thumbelina story as a child, so I would love to see Carrie Fischer. I love pretty much everything Robin Williams does. These look so fun! Robin Williams as the Frog Prince was one of my favorites. I would love to see Robin Williams in this movie! He always seems bring something great into every film he's in! I absolutely adored this series as a kid! I have been waiting for this to come out on DVD for a long time. I'd love to see Bernadette Peters again! Although, Pee Wee made a fantastic Pinocchio. And Matthew Broderick as Prince Charming? Wonderful! Angelica Houston. Loved her in Witches. I love Robin Williams! He can do anything. I watched this show when I was a kid. I adored it. My favorites were the aladdin episode and the snow queen one. I posted about it too! I really like Robin Williams! Mick Jagger. I love him as an actor! But Christopher Reeves too for sentimental reasons. I would love to see Shelley Duvall. Robin Williams as a frog - I would really like to see this. I adore this series. I especially likes Matthew Broderick as the prince to Jennifer Beals' Cinderella. It would be nice--but bittersweet--to see Christopher Reeve again in better days as Prince Charming. I really want to see Bernadette Peters & Christopher Reeve as Sleeping Beauty & Prince Charming! Howie Mandel as Wienerhead Waldo is a classic! Robin Williams is awesome. I can't wait!! Thanks for the contest and congrats tot the winner!! It has to be Robin Williams for me. He's a fantastic actor. I'd like to see Jeff Goldblum. He is so quirky and such a great actor. I wonder what he would do with his part. Paul Reubens as Pinnochio was so memorable as a child I would love to relive the experience. I loved Pee Wee Herman as the lovable puppet, Pinochio. Please accept my entry. I think I would enjoy seeing Christopher Reeves and Bernedett Peters. I look forward to the entire series, but mostly Billy Crystal; he is just hilarious! Loved the show when I was young. Would love to share with the kids! I too am most excited about Mick Jagger! I think it would be great to see Christopher Reeve in this movie, I forgot he was even in it until I went to the movie link. Paul Reubens will be hilarious as Pinocchio. If I don't win this I will probably have to go out and buy it! I remember this show! Love to see Howie Mandell before his deal or no deal persona. omigosh this brings back memories, i didnt even remember this to look it up to see if it was on dvd. my sister & i watched this religiously. i also fell in love with tim burton with this series, and watch beetlejuice at least once a week (can you believe its been 20 years already??). the cinderella story was always my favorite version. Definitely would like to see Jeff Goldblum as the wolf in "Three Little Pigs" -- he always makes such quirky acting choices that I'm sure he put his own spin on the role. Loved this series as a kid - thanks for the chance to win! I'm Excited About Seeing Christopher Reeves,ray_jay_1983@yahoo.com. I would love to see Mary Steenburgen in the Little Red Riding Hood episode. Would you please enter me in your giveaway? This was a wonderful series!!! I am most excited about seeing Robin Williams. He is one of my favorite actors.